On this date in 1942, eleven members* of a Berlin-based anti-Nazi resistance circle were executed at Plotzensee Prison — five by hanging, six by guillotine. These members of the group organized around leftist Luftwaffe communications officer Harro Schulze-Boysen and intellectual Arvid Harnack were one of three Soviet intelligence nodes all of whom were confusingly designated Die Rote Kapelle. That designation, assigned by Nazi intelligence rather than the networks themselves, has basically stuck and colored their postwar reputation with the anti-Communist politics of the Cold War. Red affiliations that blackened Die Rote Kapelle’s memory west of the Berlin wall were more readily embraced by the Warsaw Pact. 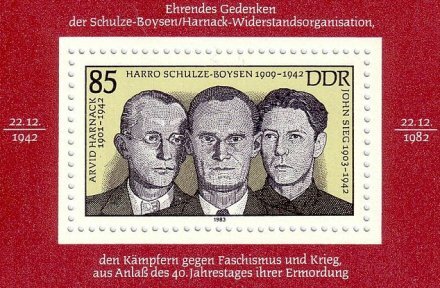 This East German stamp also honors John Sieg, a member of the circle who committed suicide upon his arrest. And not only in retrospect: according to Gerald Reitlinger, the capture of known lefties misbehaving became the occasion of a McCarthyesque freakout full of internal political score-settling among the Nazis. The affair of Burgess and Maclean will give some idea what capital can be made when someone with a leftish record enters and betrays a position of trust. The emotions roused are out of all proportion to the things that have been betrayed. [German military intelligence chief Wilhelm] Canaris declared that the conspiracy had cost the lives of 200,000 German soldiers. While the cells in France/Belgium and Switzerland also covered by the “Red Orchestra” designation look like straight NKVD espionage operations, the Berliners were apparently more of a loose network of civilian dissidents who got pulled into (amateurish) spying as a part of their variety of quixotic protests from the very citadel of the Third Reich. When not nicking sensitive documents from Schulze-Boysen’s day job and haplessly attempting to ship them to the Russians, they made futile White Rose-like gestures of conscience, like anti-Nazi placarding under the cover of darkness, and more calculated stuff, like collecting war crimes evidence in the hopes of indicting their perpetrators after the war. Well, what is one supposed to do as an anti-Nazi in Berlin in 1941? And what if one is in a position to answer that question with, “provide effectual aid to the enormous army poised to destroy Hitler”? Anne Nelson’s Red Orchestra: The Story of the Berlin Underground and the Circle of Friends Who Resisted Hitler (review | another) attempts to rehabilitate the Berlin circle from postwar red-smearing and underscore the everyday-ness of the participants (not all of them politically left) and the courage of their respective decisions to oppose Hitler actively. Nelson’s book is new, but her argument is not unique. Other books also titled Red Orchestra (Perrault, Tarrant | review of both) more strongly emphasize the commie-taskmaster dimension in what by any standard is thrilling real-life fare. The German Resistance Memorial Center has salutes to the Red Orchestra’s members, networks and activities. * Arvid Harnack’s American wife Mildred, initially condemned only to a prison term for her part in the Orchestra, had her sentence upgraded and followed her comrades’ fate on February 16, 1942.